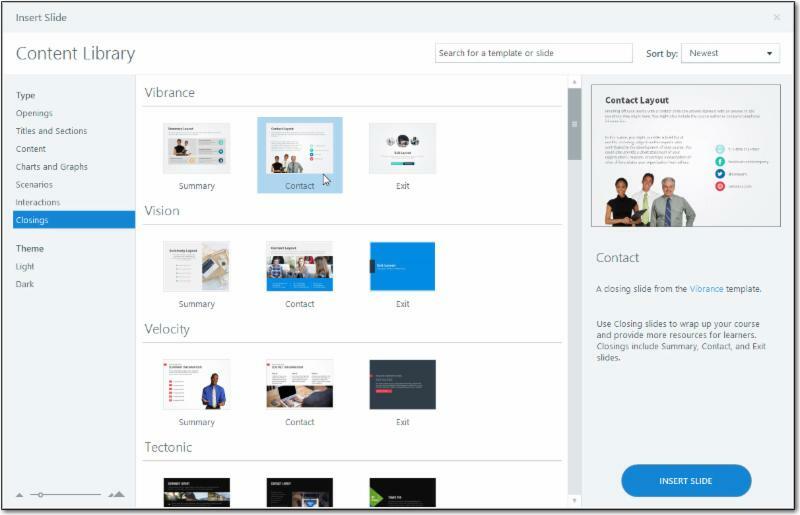 Articulate recently released Storyline 360, part of the Articulate 360 suite of products available through a subscription on Articulate's website. If you've spent any time using Storyline 2, you'll find that Storyline 360 is just about identical. And while it's true that little has changed between Storyline 2 and 360, there are some subtle improvements in the new version. For instance, there's access to the Content Library (I wrote about the Content Library last week). There is also enhanced support for multiple screens. In the image below, check out the five icons in the upper right of the preview window. By default, projects preview as a desktop user. However, Storyline 360 projects can be used by learners on several types of devices (such as desktops, tablets, and mobile devices). You can now use the Preview window to get an idea of how your content will look on those devices. I'm curious to see what my layout will look like for tablet users. All I need to do is click the Tablet Landscape icon. Not only does the slide resize to accommodate a Tablet, the Player (which was at the bottom of the Desktop version of the slide) becomes a mobile Player (it’s smaller and changes screen position). I love the fact that it's now an easy process to get a reasonable peek at what my slides will look like on multiple screens/devices. I'm also happy to see the Player behave so responsively and reposition appropriately on different devices. Looking for training on your favorite eLearning tool? We've got you covered with an assortment of half-day and multi-day courses. Kevin Siegel, CTT, COTP, is the founder and president of IconLogic. 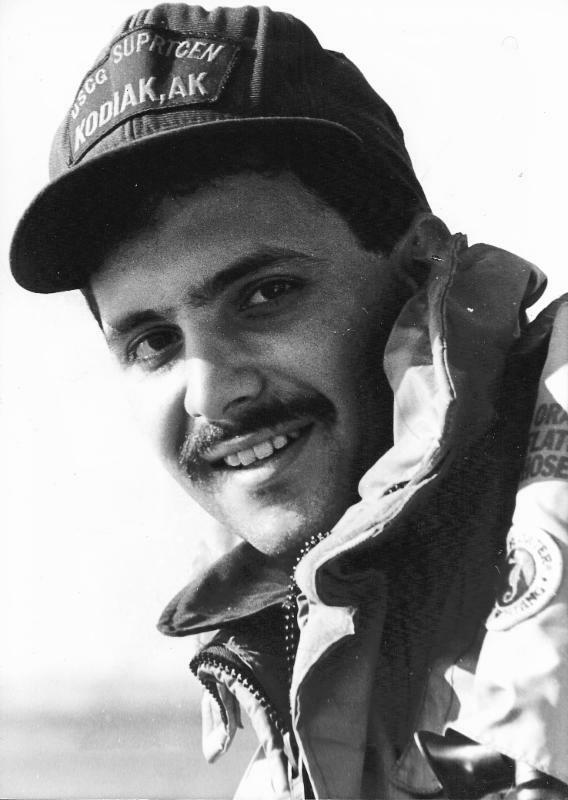 Following a career in Public Affairs with the US Coast Guard and in private industry, Kevin has spent decades as a technical communicator, classroom and online trainer, public speaker, and has written hundreds of computer training books for adult learners. He has been recognized by Adobe as one of the top trainers world-wide. MadCap Flare is a tool used to create online Help, software and API documentation, policy and procedure manuals, knowledge bases, and user guides. It's loaded with powerful features that may be unfamiliar if you’re new to the tool or haven’t taken a class. This column introduces those features to show you how to use Flare to its full potential. Ever notice that Reports folder on Flare’s Project Organizer pane? Flare has a powerful report generator that can create over 100 reports to help you manage your projects. The screen below shows just a few of those reports. Reports are easy to create. Choose File > New > Report or right-click the Reports folder and select Add Report File. The Add File dialog box, shown below, displays the template options (under Source in the upper left). 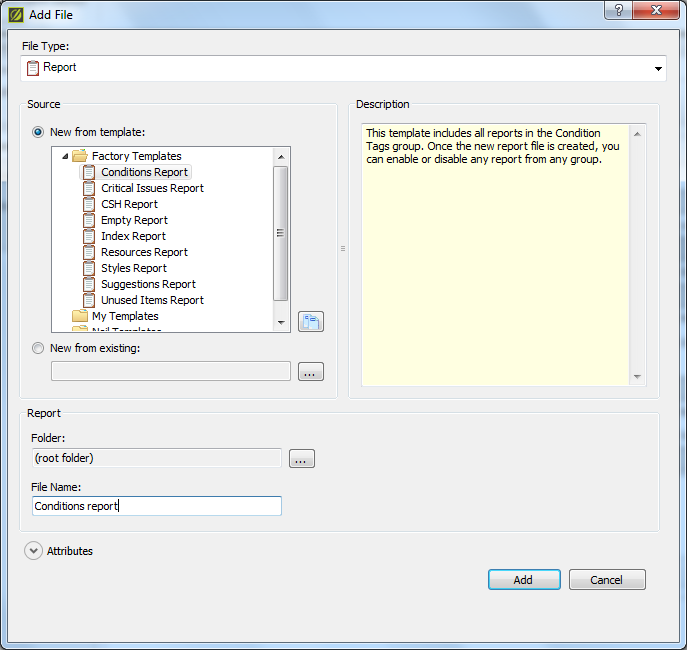 If you select one of the predefined templates, such as Conditions report, the Report Editor automatically selects all relevant reports (shown as checked in the image below). 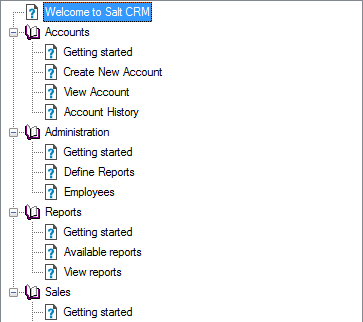 You can uncheck any of the preselected reports that aren’t applicable and manually select others. 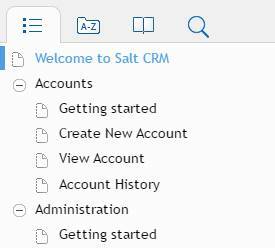 Or you can select the Empty Report template on the Add File dialog box and manually select the reports you want. After selecting the reports, click the Generate button at the lower right. The report opens in the window at the bottom of the Report Editor screen. This works for short, limited reports but takes a lot of scrolling for longer reports. The solution to that problem is to click the Open in Browser button to open the report in your browser window. You can also click the Styles tab on the Report Editor if you want to format the report for printing. All in all, the Report Editor is an easy-to-use feature that can quickly provide valuable information to help you manage your projects. Give it a try. 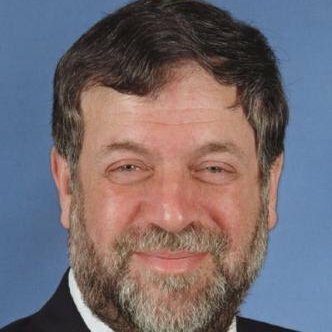 Neil Perlin is MadCap-Certified for Flare and Mimic, and is a long-time consultant, troubleshooter, and trainer for the tool, going back to MadCap’s founding in 2004. He also has years of experience with other authoring tools like RoboHelp and Doc-To-Help and some now defunct tools like ForeHelp. He is also a certified app developer, trainer, and consultant for the ViziApps app development platform. You can reach him at [email protected] and at NeilEric on Twitter. In Adobe Captivate 9, you can convert the interactive and non-interactive objects to multi-state objects and easily add additional objects to the states allowing you to quickly build interactions. 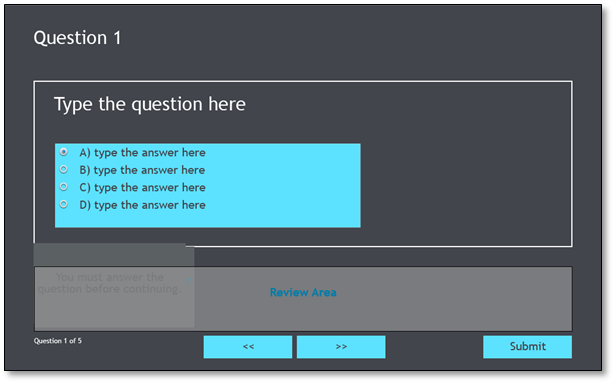 Quiz slides in Captivate are locked down, which prevent you from adding states to the question title, question stem, answer options, and feedback captions. 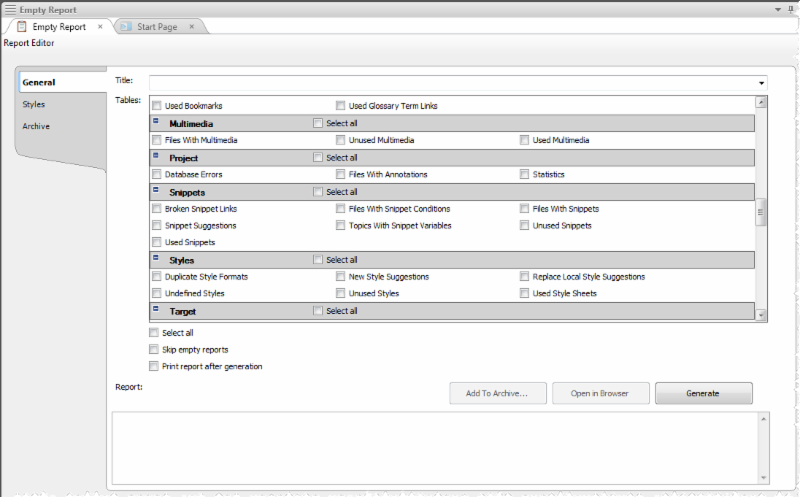 In spite of this limiation, you do have access to view the normal state of the feedback captions by clicking the State View button in the Properties Inspector. The State View area will give you a lot of power to replace the boring text feedback with video, audio, or an image--pretty much any non-interactive object to make the feedback relevant and meaningful for the learner. This step is important, as the default question objects have a higher ‘z’ order, and take the topmost position on the slide, which can result in hidden or partially visible feedback objects in the published output. In this example, our goal is to create a slide that looks similar to the image below. Insert a question slide similar to the one shown below. Add some space on the slide for a character and speech bubble by moving the question stem and answer options to the left. 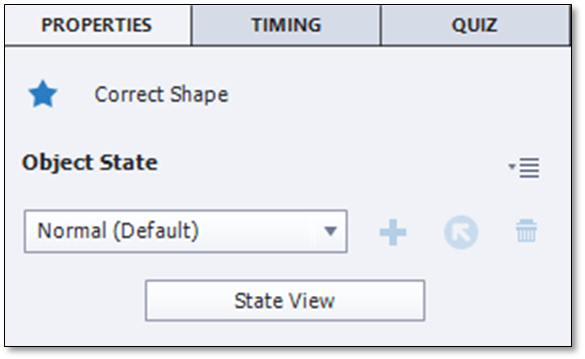 Select the feedback caption and, in the Properties Inspector, click State View. You will see the feedback caption in the Object State panel. To add a coach image like the one I used in the image above and at the end of this article, choose Media > Characters. Select a character and click the OK button. 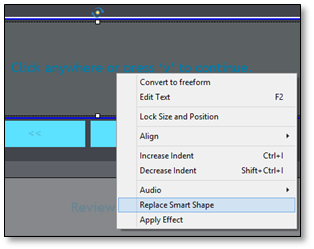 To replace the feedback shape with a speech bubble shape, right-click the feedback shape and choose Replace Smart Shape. If you are using a text caption instead of smart shape caption in your project, you can change the feedback caption type to transparent, add a speech bubble smart shape, and then place the transparent text on top of the speech bubble to get a similar effect. In the image below, I selected the oval callout and then resized and repositioned it near the character. And that's that... 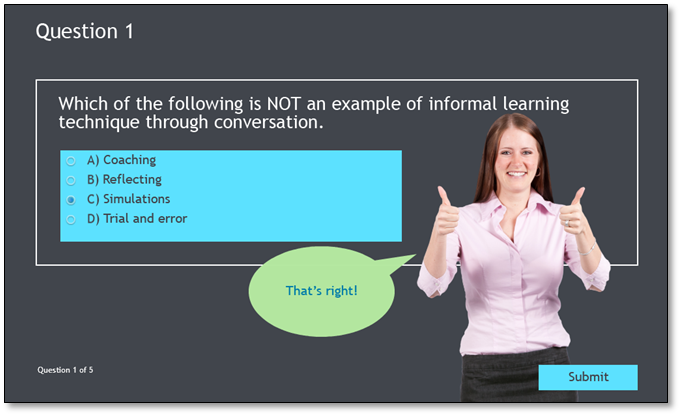 I love how easily you can convert those plain text feedback captions into something more interesting and meaningful in your eLearning courses. If you're looking to learn Adobe Captivate, check out these live, highly interactive online classes (several of the classes are taught by yours truly and I'd love to meet you in class). 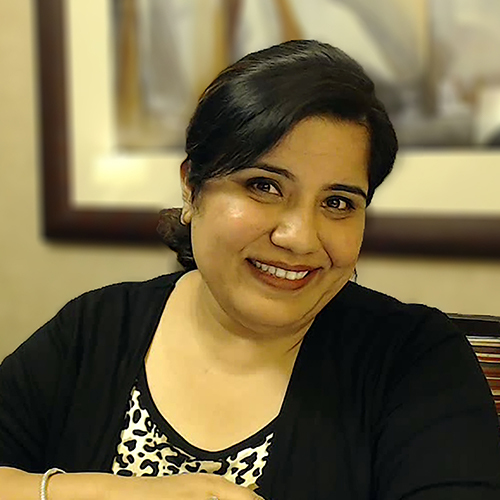 Dr. Pooja Jaisingh, COTP, the founder and chief learning geek at LearninGeeks, leads the design and delivery of eLearning and training solutions. She has created several award-winning eLearning courses and eBooks, and regularly conducts workshops and webinars on eLearning tools and techniques. In her previous roles, she worked as a teacher trainer, instructional designer, and senior Adobe eLearning evangelist. Pooja holds a master’s degree in education and economics and a doctorate in educational technology. Until now, website accessibility hasn't been a big concern for most business owners, marketers, and content creators. Owners of brick and mortar stores, restaurants, and office buildings are required by law to accommodate the needs of customers with disabilities via wheelchair ramps, braille product signage, accessible restrooms, and more. As a website owner, you will soon be required to deliver website design and content that is accessible to people with a wide range of disabilities including blindness and low vision, deafness and hearing loss, learning disabilities, cognitive limitations, limited movement, speech disabilities, and photo sensitivity. By 2018, The U.S. Department of Justice (DOJ) is expected to roll out official compliance guidelines concerning online accessibility for the disabled as part of the Americans with Disabilities Act (ADA). The DOJ will soon be expecting all websites (Federal government, state/local government, and private companies) to accommodate people with disabilities. Whether the DOJ will implement web accessibility standards is not a matter of "if," but "when." Waiting until it's the law may still make your organization legally vulnerable in the meantime if you aren't in compliance, as organizations such as Peapod, Target, Reebok, and the NBA have already found out. All of them have already been sued for website accessibility non-compliance. Attend this 3-hour live, interactive and online session and you’ll learn about the WCAG 2.0 Guidelines and what you must do to make your website functionality and content accessible today and in the future. It's been said that nothing good or useful is ever really free. Whoever said hasn't read our weekly "Skills & Drills" newsletter. Not only is the newsletter very, very free, and not only does it come out each and every week, it's chock-full of awesome tips, tricks, and news covering technical communication software (think Adobe FrameMaker, Adobe RoboHelp, and MadCap Flare) and eLearning tools (think Adobe Captivate, Articulate Storyline, Adobe and Articulate Presenter, and TechSmith Camtasia), writing (think step-by-step documentation, eLearning scripts and storyboards), and training best practices (for both live, online training and in-person training). The next issue goes out today (1 p.m. Eastern). Sign up and you'll learn about controlling Adobe Captivate quiz feedback questions, get an introduction to generating forms in MadCap Flare, and learn about an opportunity to get certified as an online training professional. Author and publish multilingual technical content across mobile, web, desktop, and print with FrameMaker. 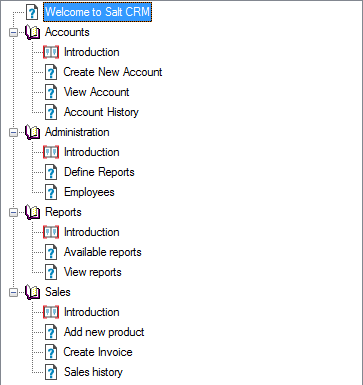 Easily work with unstructured and structured content in the same documentation. Work faster and smarter with advanced XML/DITA capabilities. Explore FrameMaker’s endless possibilities faster with reorganized and more logial menus and the new Command Search. Publish content as Responsive HTML5, Mobile App, PDF, EPUB, and more. And all this in the brand new high-dpi screen compatible interface. Create and deliver policy and knowledge base content for any device. Publish next-generation Responsive HTML5 layouts. Help users find relevant content faster with best-in-class search, including search auto-complete. Dynamically filter content for personalized Help experiences. Generate content-centric mobile apps. 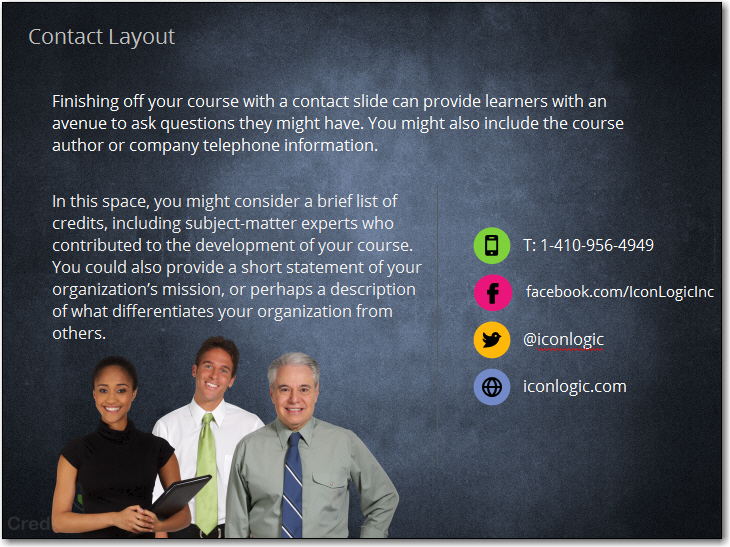 Captivate helps you create attractive and instructionally sound eLearning. Go from storyboarding to Responsive eLearning using a single tool. Dip into the exclusive asset store to enrich your content. Create amazing courses that run seamlessly across desktops and mobile devices. Acrobat changes the way you work with important business documents. Create, edit, and sign PDFs anywhere with the new Acrobat DC mobile app. Protect important documents. Send, track, and confirm delivery of documents electronically. Presenter transforms your PowerPoint slides into interactive eLearning with stunning assets and quizzes. Leverage HTML5 publishing to deliver courses to desktops and tablets. Track learner performance with the integration of leading LMSs. Articulate 360 is a collection of Articulate tools including Storyline 360, Studio 360, Replay 360, and Peek. One of my favorite things about the suite is the Content Library, a robust collection of eLearning assets. The Content Library includes hundreds or beautifully designed slide templates. The templates contain interactions, scenarios, infographics, several layouts, and some awesome content tips. You'll also find thousands and thousands of photographic and illustrated characters. And if you can't find what you're looking for when you look around in the Library, just wait... Articulate plans to constantly add new assets... in theory, this thing will never stop growing! 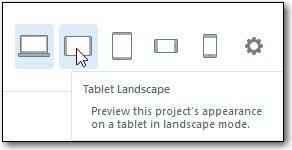 You can easily access Library assets from within Storyline or Studio 360. 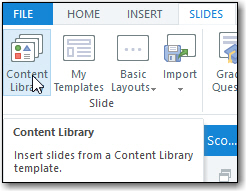 For instance, in Storyline 360, select the Slides tab on the Ribbon. From the Slide group, click Content Library (shown in the image below). The Content Library dialog box opens. In the example below, I selected Closings from the list of categories at the left. From the Vibrance group, I selected Contact and then clicked the Insert Slide button. The resulting slide looked really good. It contained images, placeholder objects, and even tips for effective eLearning content. I was able to quickly replace the placeholder content with my own content. Honestly, you can have a slide done faster than you could have ever hoped for. What will you do with all of that extra time? If you're looking to learn Articulate Storyline or Adobe Captivate, check out these live, highly interactive online classes. 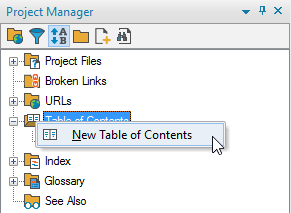 For large help systems, it is common to reuse content in the Table of Contents (TOC) when part of the system uses the same options and/or features. For instance, you might need to include a common introduction for several modules. With RoboHelp, you can include a topic in multiple locations in the TOC, allowing for easy reuse. Check out the image below. Notice that the Getting started topic is included in each of the four modules. If anything were to change within the common content, such as renaming a topic or adding a second topic, I would have to update the TOC in four locations. That is not just a lot of work, it is also a recipe for inconsistencies. 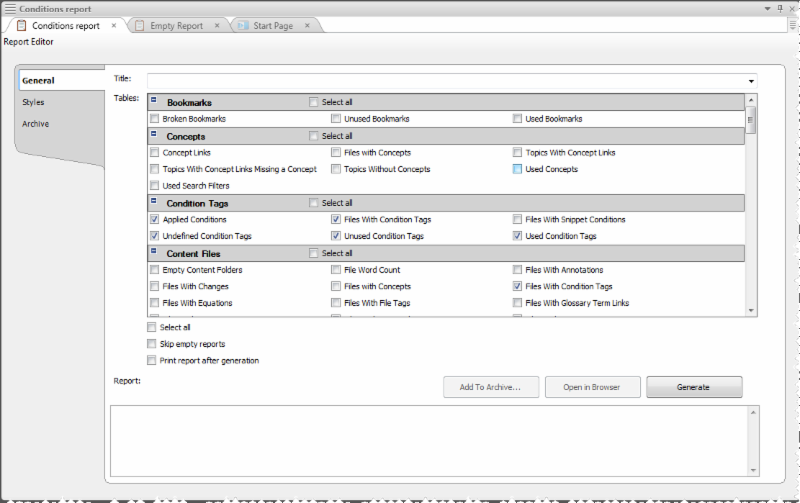 Fortunately, using RoboHelp’s multiple TOC feature, we can optimize the workflow by merging. On the Project Manager pod, open the Table of Contents folder. Then right-click the Table of Contents folder and choose New Table of Contents. Give the new TOC a name and click OK. In this sample, I call mine Introduction. The new TOC opens automatically. In the TOC, add the content that you want to share. In my case, it is just the Getting started topic. With the TOC set up with all common content, you can embed the new TOC. Go to the main TOC and select the location of the shared content. In my case, this is the Getting started topic. Click Insert TOC Placeholder at the top of the Table of Contents pod. 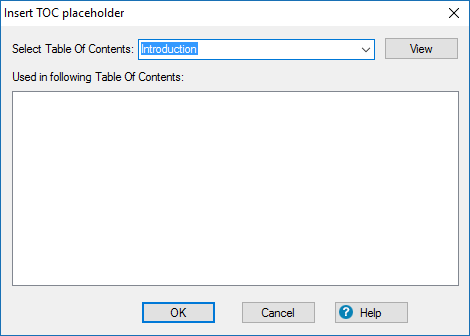 On the Insert TOC Placeholder dialog box, select the Table of Contents you want to include. Then click OK to add a Placeholder. Remove the common content from the TOC and then repeat these steps for every location where you want to include the common content. Once you have set up the project, generate the output. For your reader, the TOC will look as if nothing happened. However, if you change the name of the topic, you only have a single TOC to update. Willam van Weelden, COTP, is a technical writer and functional designer from the Netherlands. After studying to become a teacher, he made the switch to technical documentation. Willam is an Adobe Community Professional, ranking him among the world's leading experts on RoboHelp. Willam's specialties are HTML5 and RoboHelp automation. Apart from RoboHelp, Willam also has experience with other industry standard programs such as Adobe Captivate and Adobe FrameMaker.